They occupy sandy desert, although they are more common in well vegetated desert, and are found in most sandy environments.They feed mainly on small vertebrates, small rodents. Horned vipers are nocturnal and are ambush predators, lying beneth the sand with only the top of the head protruding. They are very tolerant of traffic in close quarters. If threatened they will curl up into a horseshoe shap and rub their rough scales together creating a loud rasping sound. Although rare, the bite of this snake can produce life-threatening symptoms. This species is widely distributed in the Arabian Peninsula in suitable habitat, Absent from the mountainous regions and the central Rub al-Khali, they are numerous in Kuwait, Bahrain, Saudi Arabia, Oman, Qatar, United Arab Emirates, and Yemen. Parts of Palestine, Jordan, Iran and Iraq. 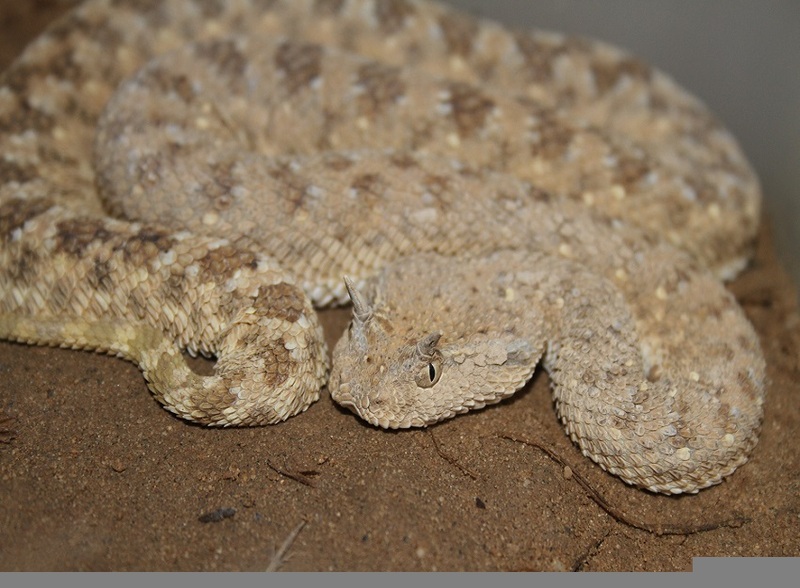 Arabian horned viper adults average around 45-50 cm, and exceptionally reach 100cm. The head is flat, wide and roughly triangular in shape. The horn above each eye may or may not be present. The neck is thin, body is stocky and roundish in section. The tail is distinct, especially in females. Scales are heavily keeled, giving the snake a rough appearance. The colours vary regionally, but mostly are tan or pale grey/brown, generally matching the sand in which they live. A single row of darker, wide transverse rectangles runs down the back. A single row of spots runs down each flank. The tail may be distinctly different in colour or just a continuation of the body colour.